I have been living in the Middle East for more than 5 years. There are many local dishes and salads that are absolutely wonderful. Many of them I haven’t tried at home. 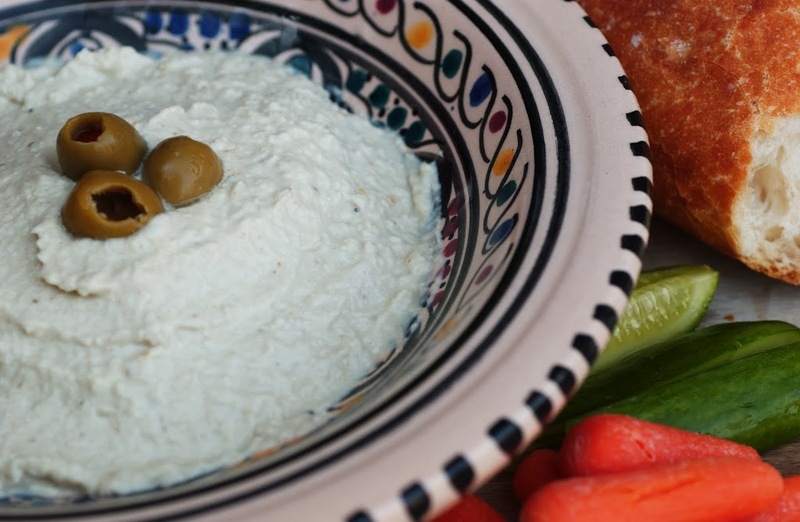 However, the regional dips Baba Ganoush (eggplant dip) and Hummus (chick pea dip) are easy to make and absolutely delicious as a starter with raw vegetables (like mangetouts, cucumbers, celery, or carrots) or breads (I like to dip anything from local pitta bread over rustic baguettes to my home-baked wholegrain bread). They are also particularly good as a spread on wraps. And this is where we had the Baba Ganoush tonight for dinner: on a wrap with wok-fried vegetables and some spicy grilled chicken slices. The eggplant itself is not high in any vitamins or minerals. However, it is very filling while having few calories and containing virtually no fat. Bon appetit!!! Pierce eggplant in several places with a fork and put on a grill pan. Grill in the oven and turn frequently, as close to the heat as possible for about 15 minutes or until skin is charred. When cool enough to handle, peel the eggplant and halve lenghwise. Discard as many seeds as possbile. Combine all ingredients in a food processor and blend to a paste. Serve in a bowl garnished with parsley leaves.